It’s part of the home that you try to hide. It’s one that you hope no one stumbles across and, of course, hope no one sniffs and notices it is there. As much as you would like anyone else to take care of cleaning and maintaining the litter box, it’s probably your job. Here are some simple tips to do it faster — and better — and keep things a little more sanitary as well. One thing most hate is when the cat (or cats) leave the litter box and bring those tiny litter particles with them, tracking them all over the home. Placing a mat under the cat box or some type of carpet remnant where the cats step out on helps reduce the amount of litter tracked through the home. Litter boxes are festering tubs of bacteria and other contaminants that need to stay right there in the box. But a cleaning must happen, at least every day, to keep the clumps from taking over and becoming difficult to scoop. Wear a proper pair of gloves, and even a dust mask, to keep yourself healthy and safe when doing the scoopin’. Besides daily scooping, adding some litter every few days is smart. When the litter gets low, add a little more to keep the litter box sufficiently full so your cats can easily cover over their “deposits”. You don’t want to give them any excuse to skip the litter box for a more convenient area to use, if you know what we mean. And each month, empty and completely wash the pan, and add fresh litter. One thing that cats may do from time to time is “miss” the litter box, creating nasty odors, especially in carpet. That’s when you need some real help from your favorite carpet cleaning service. Do the right thing. Give them a call. After all, it pays to call a pro! Your home has plenty of areas for dirt and grime to hide. Finding them may seem easy. Cleaning them effectively is a different story. Most homeowners spend plenty of time sweeping, vacuuming, scrubbing, and cleaning areas that are obviously dirty and become so daily. There are other areas that can really get gross in a short amount of time. Your bathroom vanity cabinets are prime locations for soil buildup. This is one area of the home easy to ignore. After all, who looks in there besides the someone looking for some face cream or hand lotion, among other items? The buildup of residues can wreak havoc over time. Think of hairspray that you use daily and that ends up on the top of the cabinet. It's easy to clean when fresh but after 10 or more applications you have a nasty “goo” on the counter. Not to even mention toothpaste and other necessary items that get smeared on the same surface. Take some time each day to quickly wipe up any residues that land on the surface. Then, take some time each week to open up any cabinet doors or mirrors with storage behind them, remove all objects, and use a household cleaning solution to wipe down all surfaces. After a week, you will be amazed at how much residue has built up in there. Imagine what could happen after a few months! Once a month, give your entire bathroom a close look and find those nooks and crannies that can be the host of soil. This could be behind the toilet, in the corners of shower stalls, or where the soap resides on the bathtub edge. All these areas could use a good scrubbing each month, if not more frequently. All this is besides the typical routine cleaning you give all your bathrooms. Make it a New Year's resolution to keep every inch of your home squeaky clean. Just spending a few minutes cleaning the untouched parts of your home can help with other spot cleaning. This will help with every day cleaning and cut down on mess. Flood damage due to rain isn't too much an issue this time of year, however your home could still be at risk for flooding. The temperature can drop pretty low during this point of the winter. This is bad news for the pipes in your home. If the temperature drops low enough, your pipes run the risk of freezing. Frozen pipes can burst which can lead to a flooded home. Take precaution to prevent damage to your home and your pockets. The simplest thing to prevent frozen pipes is to allow your faucets to drip to keep the water flowing. Even this tiny movement doesn't give the water the opportunity to freeze. You can also keep your thermostat at a constant temperature to prevent burst pipes. Be careful this winter. If your pipes do burst, call a water damage professional! Christmas is quickly approaching. Only 17 days left to prepare! Are you ready? Are the presents wrapped? The tree decorated? Most importantly, is your home ready for many guests? Who doesn't want their home looking it's best for company? Unfortunately, we can't help you with the house cleaning but, we can help with any carpet, rug, tile, or upholstery cleaning you may have. Clean carpets are our gift from our family to yours. Don't wait until Christmas hits you, get your carpets cleaned today! It may just be fall right now, but that’s about to change soon, into… winter. Getting ready for winter is important, especially for your home and protecting what’s most valuable to you. Obviously, winter is outside, but it will want to get inside, and that can cause damage you definitely don’t want. Look around, inside and out, and check if the weather stripping is damaged, if there are cracks in the caulking, and gaps where gaps should not be. Can you hear the wind coming in the windows, or from around the windows? That’s not so bad right now, but when nasty weather strikes, that’s a different story. Get your windows in shape now, before winter arrives. You can see some of your roof from the ground, but if take a close look, you might see some roofing repairs need to be done. Shingles might need to be replaced, areas around the chimney or vents that could use some plugging, or other general repairs that are a lot to do easier now rather than when it is zero degrees and icy. But be safe! If you aren’t an expert and able to inspect, hire someone to do it for you. Grit, debris, leaves, and obstacles tossed up there from a windy day can build up. If winter strikes and your gutter has build up, it can create really expensive restoration work. If your gutter can’t drain, this might force melting ice into your home. Get a ladder and take a look. But just like with your roof, only do that if you are an expert. Hire it done if you aren’t. ​No matter what you do, occasionally water, wind and ice can damage your home. Protect yourself and your home: Call your disaster restoration pro. After all, it pays to call a pro! There has been a lot of rain lately here in Charlotte this week. With all the leaves on the ground and the mud being tracked in, your carpet is taking heavy hits. This problem becomes especially worse when you have dogs. Your dog may be man's best friend but right now it isn't your carpet's. To keep your home looking clean (which is really important with the holidays right around the corner), here are a few tips to have your home looking holiday ready. You should vacuum your home the same amount of days a week as there are residents in your home (including pets). For example, if you have four people and one pet living in your home, you should vacuum five times a week. This will keep your home tidy and actually prolong your carpet's life. Remember to also get your carpet cleaned at least once or twice a year. Doing so will also help prolong the life of your carpet and make your home look beautiful. If you guessed “the bathroom” you wouldn’t be wrong; it is the most frequented room in a home. However, hands-down, the kitchen is the most welcoming, most enticing room in your home. Delicious food preparation, nice conversations, and a general gathering place for family and friends makes it a beloved room. With that much usage, it creates the need for cleaning. To make the unwanted task of cleaning a little easier, here are some simple maintenance tips that will save you time. The sink, counter tops, stove, and cabinets get heavy use, and the residue can be sticky and challenging to remove. The most aggressive cleaning is probably in the sink, where grime can build up that isn’t visible. Use cleanser and a sponge or cloth and clean multiple times, rinsing often. It should squeak when you run your fingers over it. The other areas should be cleaned with an all-purpose cleanser and wiping it off with soft cloths. A final wiping with a cloth and warm water will remove any cleaning residues. If this is done every day or so, you will never notice a buildup of grime or dirt. Sweep and mop on a schedule before it looks like it needs it. A regular broom with soft bristles picks up more debris than a dust mop. Hot water and a detergent for the type of flooring you have is recommended, but don’t overdo the concentration as it can leave streaks. Something often neglected are the drawers, especially those that hold cooking utensils. Take a look at the drawer that holds your silverware, pull out some forks or spoons, and you will see bits of all kinds of food and debris hiding underneath. Every week, plan on cleaning just one drawer and they will all stay nice and neat. Cleaning like this will help you get ready for the holidays and have your home clean for the new year. It's starting to get cold here in the Carolinas and the leaves are starting to fall. It's important to make sure your home is ready for the winter. 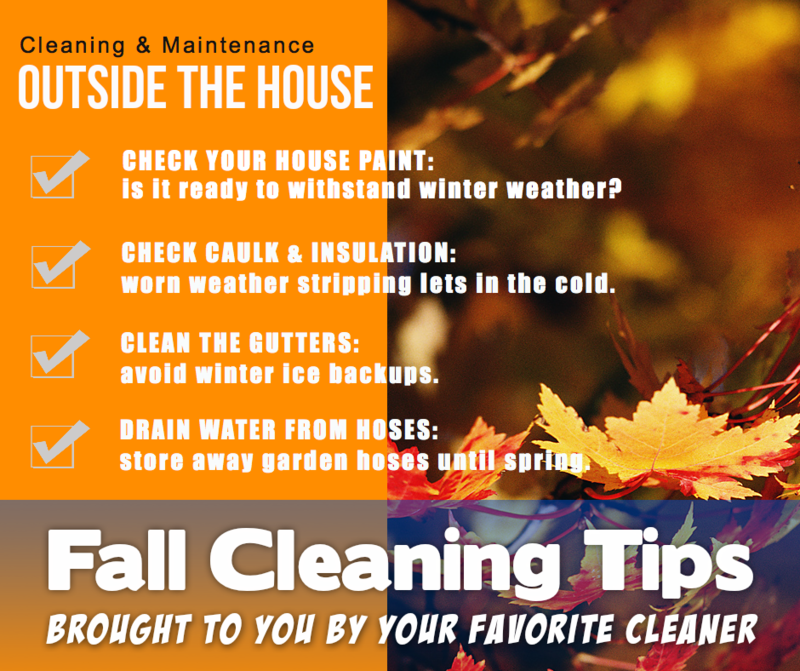 Cleaning any leaves and making sure your home is sealed is essential during the winter. Follow these tips and your home will be ready for the frost! 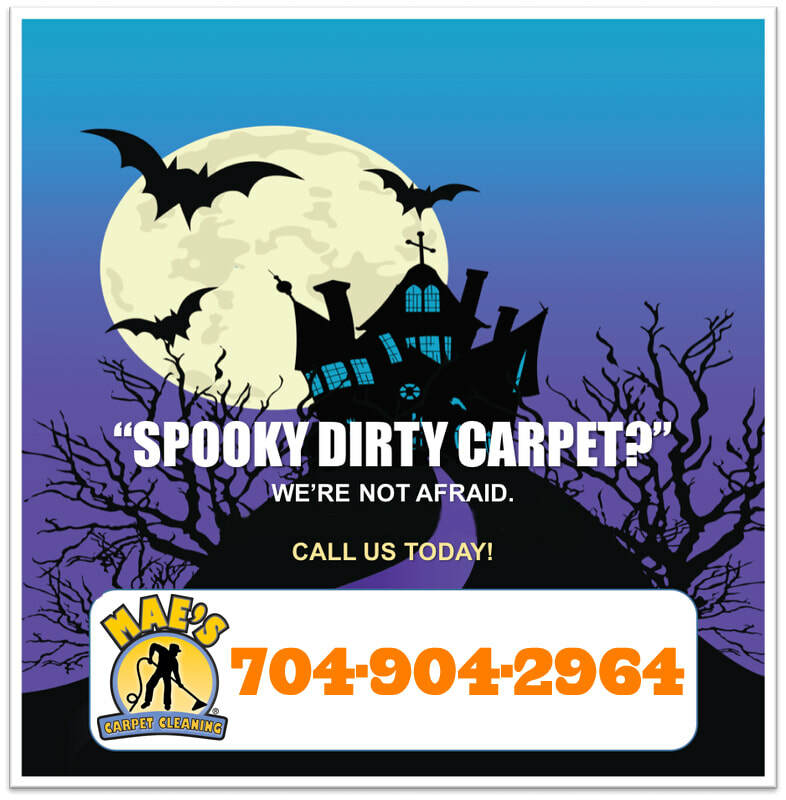 No need to fear, Mae's Carpet Cleaning is here! For any scary looking carpets you may have, we have the solution. Call us or book online and the only thing scaring you this Halloween is the movies. Just like how a washing machine removes dirt and smells, you would think cleaning your carpet with a machine would do the same. Unfortunately, this is not the case. The urine, especially if it's a lot, must be flushed out before the smell goes away completely. This is because the urine soaks down into the padding of the carpet. Imagine your carpet is like a sponge. Any liquid that doesn't get cleaned up right away gets soaked up by the carpet. You might not smell the urine, especially if your dog just had a small accident. The "Rug Doctor" you rent can clean the surface stains but once the water hits the lingering urine, the smell reemerges. If you want the smell gone, make sure you call a professional to flush out the urine and make your home smell good again. 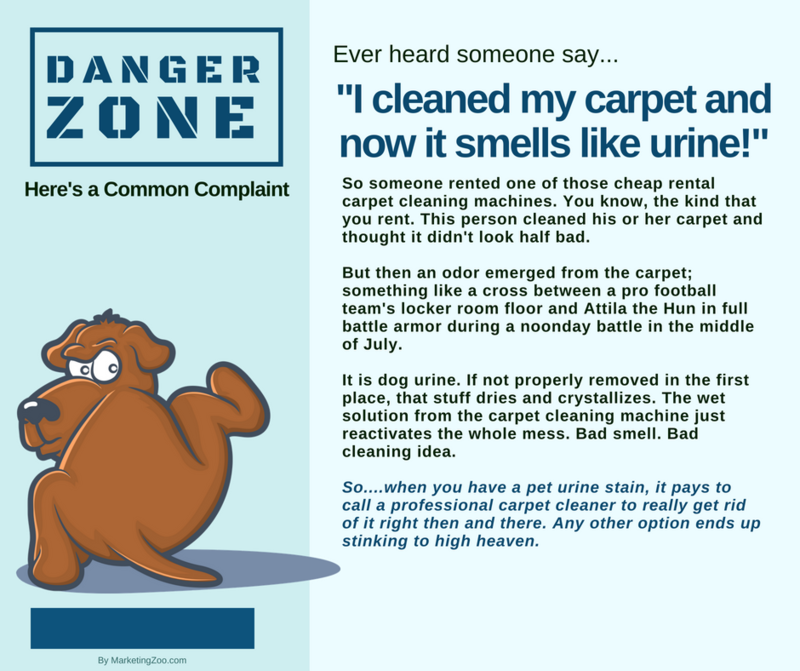 Call 704-904-2964 or book us, Mae's Carpet Cleaning, to help you with any urine problem.